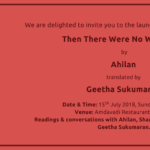 HomeLiterature Book Launch | Naan Yen Kavingyar Aagavillai? 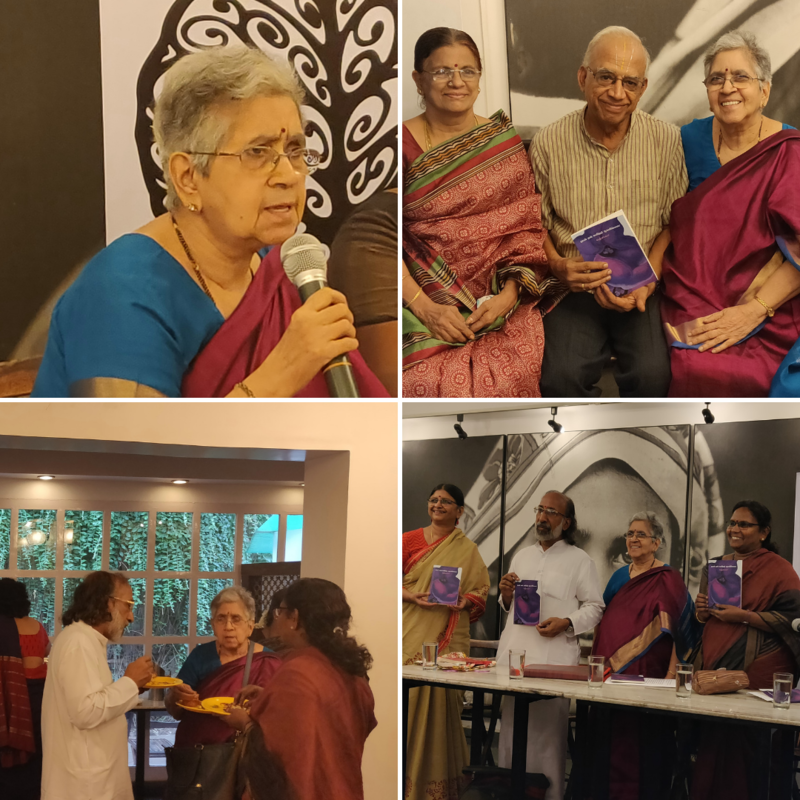 As part of Poetry with Prakriti monthly series for August, we were delighted to launch the book of poems titled ‘Naan Yen Kavingyar Aagavillai?’ written by R. Vatsala. 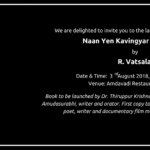 Date | August 3rd, Friday at 5.30 p.m.
Programme | Book to be launched by Dr. Thiruppur Krishnan, editor of the Tamil magazine Amudasurabhi, writer and orator. First copy to be received by Ravisubramanian, poet, writer and documentary film maker and Ilampirai, poet. Refreshments will be provided. All are welcome! Vatsala’s poems speak for women everywhere, detailing with great honesty and compassion. Even though they appear to be about the self, this “self” is comprised of a web of female selves. Lyrical and powerful at the same time, the poems in Naan Yenn Kavingyar Aagavillai? (Why Didn’t I Become a Poet?) are an important addition to the growing canon of feminist poetry in Tamil. Employing irony, humour and rhetoric, they seek answers to questions that are central to feminism today. They also attempt to understand what it means to be human and are a judicious mix of dark and light themes. R. Vatsala (born 1943) is a Tamil poet, fiction writer and former Systems Engineer at IIT Madras. Known for their feminist stance, her works have been published by literary magazines such as Subha Mangala, Kanaiyazhi and Pudiya Paarvai. Vatsala’s books include the poetry collections Suyam and Naan Yen Kavingyar Agavillai and the novels Vattathul and Kannukkul Sattru Pazhaniththu. An English translation of Vattathul by K. Srilata and Vatsala was published by Writers Workshop under the title, Once There was a Girl (2011). Vatsala has won the Illakkia Chintanai award, the Agni-Subhamangala award, the Rajeswari Balasubramaniam award and the Thiruppur Tamil Sangam award. Her poems have been widely translated into English and have been featured in anthologies like The Rapids of a Great River: The Penguin Book of Tamil Poetry (2009), Interior Decoration: Poems by 54 Women From 10 Languages (2010) and All the Worlds Between (Yoda Press 2018). ‘Poetry with Prakriti’ began in 2007, as a ten-day annual festival. The aim was to get poets from varied backgrounds to read and share their poetry in various languages at different locations across the city. What makes the Poetry with Prakriti unique, is that readings are held in diverse places bringing poetry closer to the public. Some of the poets who have been featured in the past include Alvin Pang, Geralyn Pinto, Bishnu Mohapatra etc. 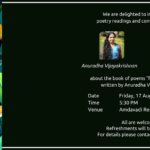 We are delighted to announce that Poetry with Prakriti has become a monthly series since August 2017. Various poetry events and performances are being conducted in different venues every month.